About a year ago, not too many people on this side of the Atlantic knew who Rory Gallagher was. While he is almost a superstar in Europe, his popularity in the States is very limited. However, though he has no hit records here, extensive touring is slowly but surely earning him an amazingly ardent bunch of fans that are steadily growing in numbers. Gallagher's first recognized band was Taste; a three-man effort that was often compared to Cream. That band was together for four years with a fluctuating membership before it finally gained any recognition. In 1969 and 1970, that band released its only studio albums which were highly acclaimed and even sold fairly well. Then Taste dissolved, and Gallagher formed his own band. The first Gallagher band lasted for three albums, until drummer Wilgar Campbell left to be replaced by Rod De' Ath. A couple of months later the band was further augmented by keyboard player Lou Martin. Gallagher has kept this band for two years so far and has just released his third album with them. The album is a double record set recorded live from various concerts in Gallagher's native Ireland. With his latest band, Gallagher has taken almost complete control of his sound, and besides doing all of the guitar work, he also handles all of the singing, harmonica playing and production. The last time Gallagher was in Cleveland he became the first national performer to sell out the Agora two nights in a row. The SCENE talked to him over the traditional past time of the Irish...drinking. SCENE: I think your music is about the closest thing to a real blues-rock fusion in a long time . GALLAGHER: My music is for the most part blues. I don't like to call it blues-rock because that simplifies it too much. I mean there is some rock in it, but that is to be expected since I first got interested in the guitar listening to Elvis and Buddy Holly and people like that. There is more Chicago blues influence in the music than there is rock. SCENE: It seems, though, like you convey a lot more energy than most blues does. GALLAGHER: There are a lot of Chicago blues bands that have that same excitement and energy. Paul Butterfield and Muddy Waters have the same kind of energy. That is one of the characteristics of Chicago blues, its toughness. It has a street feel to it. It's real tough and hard-driving. I like to get the same effect in my music. SCENE: Your first successful group was Taste. It broke up just when you were starting to get really popular. Did you fire the other members or did they quit? GALLAGHER: No, Taste just sort of dissolved. Our musical tastes and goals were going in different directions and after a while it just became useless. When you stop smiling on stage it's time to call it quits. SCENE: Was there any specific reason why you didn't just reform the band? GALLAGHER: There were legal problems with that. The manager of the band had the rights to the name and there were a lot of legalities in the way of a new Taste. The Gallagher bands aren't bands in the same sense as say, Taste, in which every member had an equal part. My band is my back-up band in the same way as the big bands. Like Duke Ellington. There are no legalities to get in the way of the music. If someone quits or gets fired, he is simply replaced. When Taste split up I couldn't do that because the name belonged to the manager. That always happens when you have a band with some name. SCENE: Yeah, I guess Grand Funk knows that better than anyone. GALLAGHER: Right. The band I have now is my band. If I would have given it another name, then it would belong to everybody in the band and the possibilities of legal hassles compound. The Gallagher band belongs to me and that way nothing gets in the way of the music. Of course it's nice when you play with someone for over two years. It's a lot easier. SCENE: Besides playing guitar, you also play electric mandolin, don't you? I missed that on IRISH TOUR ‘74. GALLAGHER: I play acoustic mandolin on the LIVE IN EUROPE album. Actually I still carry it around with me, but I just haven't gotten a chance to use it lately. Mandolin has very limited use, usually it creates a sort of country bluegrass sound. I may start using a mandola, which has a lower tonal range and is a lot more versatile. 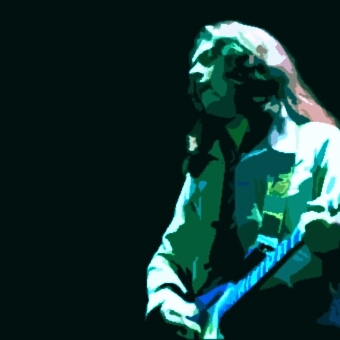 Rory Gallagher - "Playing guitar is how I always wanted to live"
SCENE: It seems like a lot of the blues bands that were responsible for the revival have sort of moved on to other sorts of music. Mayall has branched out into jazz. Elvin Bishop is into country. Even Paul Butterfield has picked up a lot of country influences. GALLAGHER: Yeah, that's true, but at the same time there are a lot of other bands that have incorporated the blues into their music. The Allman Brothers have a heavy blues sound. The blues is being mixed with a lot of other music, especially country. Since I write most of my material I can't help but pick up other influences. But, I don't intentionally push it in any direction. I just write what I happen to feel at the moment. The music tends to evolve more naturally. SCENE: How do you like touring the U.S.? . GALLAGHER: I spend about 10 months out of the year on tour. I really enjoy it. When you're on tour, you don't really see that much of the cities. There are a few clubs that I especially like, but every place has its good points. SCENE: Although you have an almost fanatical following in the U.S., your albums haven't really sold on any mass basis. GALLAGHER: My popularity in Europe is about 4 times as big as it is in the States. All of my albums are best sellers there. I still need a strong selling record here. Once that happens things will start rolling here too. With the last couple of tours things have been getting better and better, though. SCENE: Do you think that the live album (IRISH TOUR '74-ed.) will be the seller? GALLAGHER: Well, I hope so, but that's not why I did it. I don't record specifically to sell albums. I like to do a live album about every four studio albums. The last one I did was with the old band, three albums ago. This is the first live album with Lou and Rod. I probably won't do another for a couple of years. SCENE: This is also the third album that you produced. Do you have any plans to produce anyone else? GALLAGHER: I started experimenting with the production. And after a while I might help somebody else out. But that's all it would be - a helping hand. I wouldn't even necessarily get credit for it. I've had some offers, but not from anyone famous or anything like that. SCENE: Do you think you'll ever have anyone else produce your albums again? SCENE: You seem to get an almost live sound in the studio. GALLAGHER: I don't specifically try for that, but I don't do a lot of overdubbing, just a guitar here and there. SCENE: Are you working on any studio albums now? GALLAGHER: Not right now. I'm concentrating on the tour. Next year, sometime, I'm going to record an acoustic album, but I don't have any definite time schedule to do any recording now.